Comet C/2014 Q2 Lovejoy, Widefield view, false color. Feb 8, 2015. Credit and copyright: Joseph Brimacombe. The source of comets was originally proposed by Gerard Kuiper in 1951, when he theorized that there must be a vast disk of gas and dust surrounding the Solar System, out beyond the orbit of Pluto. This “Kuiper Belt”, contains millions of objects, which orbit the Sun, jostling each other with their gravity. These interactions kick these Kuiper Belt comets into orbits that bring them closer to the Sun, where they get their characteristic tails. Astronomers call these short period comets, since they orbit the Sun relatively often. They’re given names and designations, and astronomers can calculate when the comet will pass near to the Sun and flare up again. The famous Halley’s Comet is a good example, which was known to antiquity, but had its orbit first calculated in 1705 by Edmond Halley. Every 74 to 79 years, Halley’s Comet swings near the Sun, flares up and we get a view of this amazing object. It last passed our area in 1986, and it’s not due to return until 2061. I should be in my third robot body by then. The long period comets are much more mysterious. These objects come out of nowhere, pass through the inner Solar System or smash into the Sun, and then zip back out into deep space. Now, where do they come from? The Dutch astronomer Jan Oort calculated that there must be an even vaster cloud of ice even farther out beyond the Kuiper Belt – between 5,000 and 100,000 astronomical units from the Sun. Just a reminder, 1 astronomical unit is the distance from the Earth to the Sun, so we’re talking really really far away. 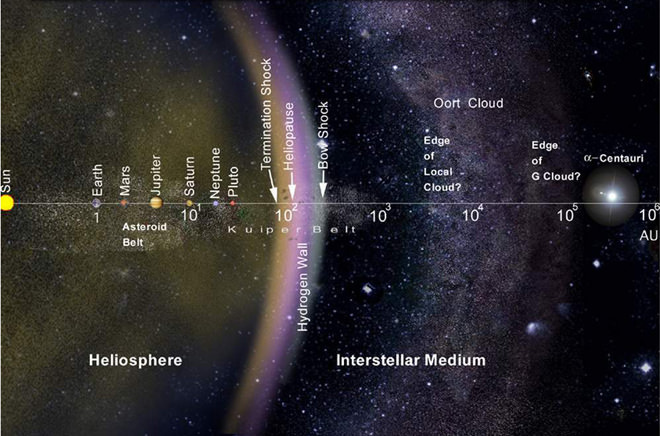 Like, the Voyager 1 spacecraft, which is the most distant and fastest object ever sent out by humanity, will still need about 300 years to reach the edge of the Oort Cloud. Astronomers think that occasional gravitational nudges in the Oort Cloud cause these long period comets to fall down into the inner Solar System and make their rare appearances. It could take a comet like this hundreds of thousands or even millions of years to complete an orbit around the Sun. I’ll need a few dozen robot bodies for that repeat observation. Check out this cool picture of Comet C/2017 K2 PANSTARRS, taken by the Hubble Space Telescope. This is a great example of a long-period comet, which is visiting our neighbourhood for the first time in the 4.5 billion-year history of the Solar System. This is the dimmest, farthest comet ever discovered, first seen when it was out beyond the orbit of Saturn. This cloud of material around the comet is probably the sublimation of frozen volatile gases, like oxygen, nitrogen, carbon dioxide and carbon monoxide. Astronomers think it started to become active about 4 years ago, and they just discovered it now. As it gets closer to the Sun and warms up, it’ll become a true comet, when its hard-as-rock water ice structure starts to sublimate and earns its tail. It should make its closest approach in 2022 when it gets about as close to the Sun as Mars. And this is why we can’t detect out into the Oort Cloud yet. We can barely detect comets outside the orbit of Saturn, not to mention hundreds of times farther than that. Our Sun isn’t alone in the Milky Way, obviously. It’s a vast swirling storm of hundreds of billions of stars, and over the tens of thousand of years, other stars come much closer to the Sun than we see today. The European Space Agency’s Gaia spacecraft recently released one of the most detailed maps of stellar positions and motions, and gave us a much better picture of where our Sun is going, and what it’s going to be interacting with in the future. In order to interact with the Oort Cloud, astronomers have calculated that a star needs to get within about 6.5 light years before it can interact gravitationally, depending on its mass. Credit: ESA / Gaia / DPAC / A. Moitinho & M. Barros, CENTRA – University of Lisbon. Based on data gathered by the Gaia spacecraft, astronomers charted out the motions of 300,000 stars in our vicinity of the Milky Way in the next 5 million years or so. Of those stars, 97 will come within 15 light-years of the Sun, and 16 will get closer than 6.5. The most interesting of these is Gliese 710. In 1.3 million years, it’ll pass less than 2.5 light-years away from the Sun, plunging right through the Oort Cloud. Gliese 710 has about 60% the mass of the Sun, and it’s going about half the speed that stars normally go as they sweep past the Solar System. Which means that it’s going to stick around for a long time, pushing comets around with its mass, and send showers of comets down into the Solar System. On average, it seems like a star passes within 15 light-years every 50,000 years or so, jostling up our collection of comets. This is important, because comet impacts could be a cause of past extinction events on Earth. By tracking the movements of stars in our region, astronomers could try to match up past events with times that stars jostled up the Oort Cloud, and predict future events. Could we ever reach the Oort Cloud and explore it? A few years ago, a space observatory was proposed that could attempt to observe objects as distant as the Oort Cloud. Known as the Whipple Mission, it would orbit in the Sun-Earth L2 point, and watch the sky with a wide field of view. It would try to detect transiting events when objects as small as a kilometer across passed in front of a more distant star. In theory, the mission would be capable of spotting these transits out as far as 22,000 astronomical units or nearly half a light year. Unfortunately, it hasn’t gotten past the proposal stage. Another intriguing idea is known as the FOCAL mission, which involves sending a space telescope out to a distance of 550 astronomical units away from the Sun. At this point, the telescope can use the gravity of the Sun itself as an enormous lens, focusing the light from more distant objects. Actually, you’d need to go farther. At 550 astronomical units, the sunlight drowns out anything the space telescope might try to see. Instead, it needs to go out to a distance of more than 2,000 astronomical units from Earth, when the light focused by the Sun turns into an Einstein Ring around it. What could you do with a telescope like this? If an exoplanet were to pass behind the Sun, perfectly lined up, you could resolve features as small as 1 kilometer across on a world 35 light-years away. A telescope like this gives us a very good reason to learn to travel out and explore the Oort Cloud. The Gaia spacecraft is still hard at work gathering data, and astronomers are expecting another massive data dump in April, 2018. Over time, the spacecraft will map out the position and movements of a billion stars in the Milky Way. Comets are awesome, and I’d like to see a visible comet in the night sky, but I’d like them to keep their distance. This was a really excellent article explaining the origins and discoveries of the Kupier Belt and Oort Clouds, and also had some far out stuff about Einstein Rings and distant space telescopes at the end. Are you sure our Sun is massive enough to generate an Einstein Ring? I thought only large galaxies could do so. I’m confused by the 2 different distance units with the same value. 550 a.u. or light-years? a.u. kind of makes more practical sense to me. Couldn’t we use a more massive star and observe its lensing from near here?